We all know Easter weekend is a very busy time for coffee’s & cakes! With both, the Friday and Monday being public holidays. Hooray! We hear you say. But don’t get caught without cake. 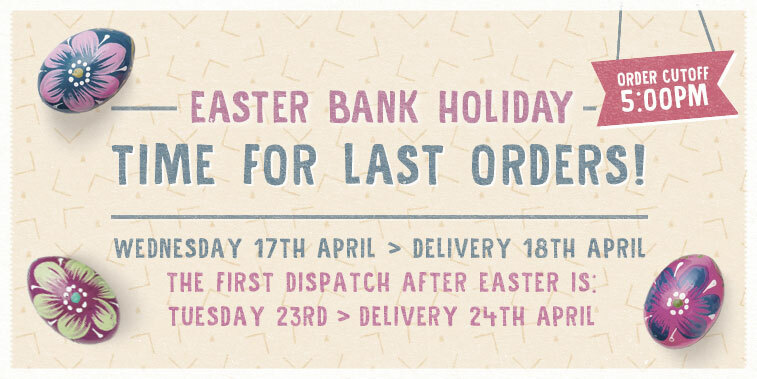 Last orders will be 5pm on Wednesday 17th April - For delivery on the 18th. The next despatch date will not be until Tuesday the 23rd of April - For delivery on the 24th. So there will be no despatch on 18 - 22nd April. All orders placed over the Easter weekend will be despatched on the 23rd unless otherwise selected. We hope you have an extremely prosperous Easter.